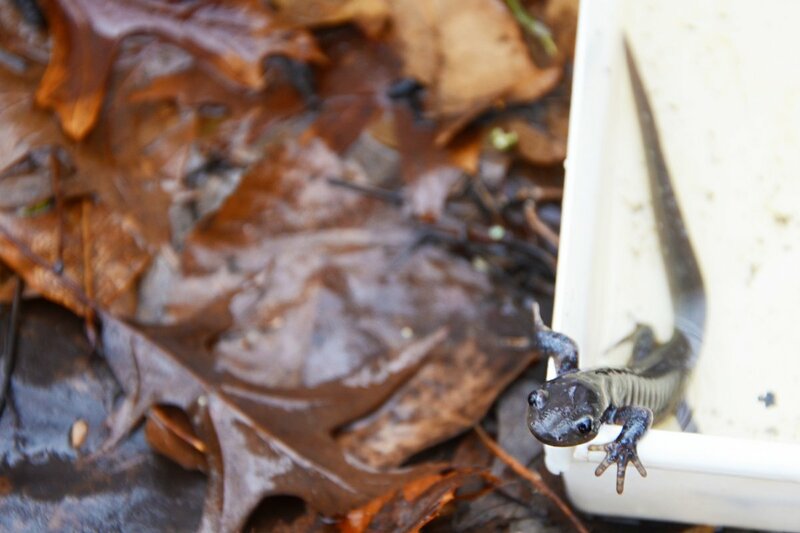 Home / Blogs / Salamander hunt! This Jefferson Salamander kept trying to check us out by staring up at us. 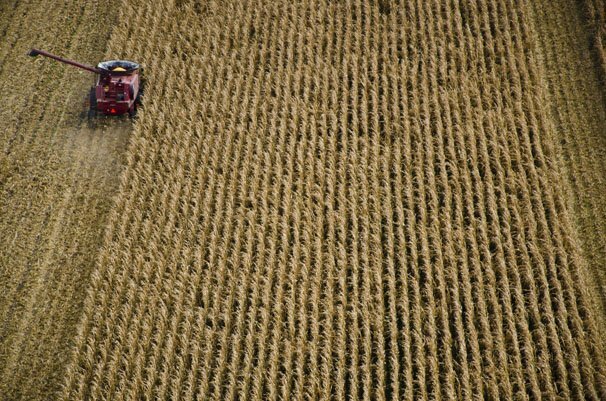 Thus, I found myself clad in mud-covered boots slogging through the fields and forests of central Ohio after steady rains saturated the landscape. Fortunately there was a brief respite from the endless precipitation, but that was about all that could be said positive about the weather. Temperatures were on the short side of 50 degrees and unpleasant winds made things pretty chilly. 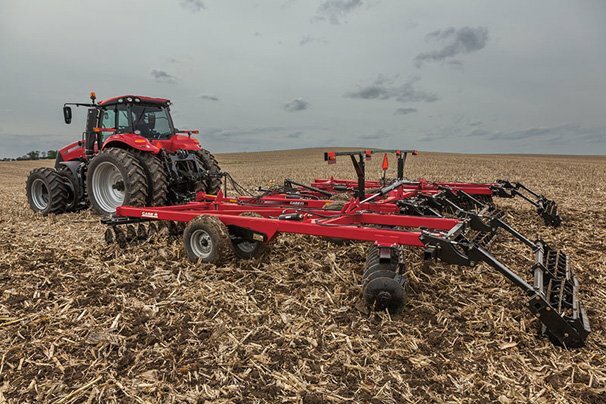 Even on the driest parts of the journey we left inch-deep footprints in between the corn stalks and we routinely found ourselves in calf deep water fighting to maintain balance from the uneven forest footing on this fairly unpleasant late February day. 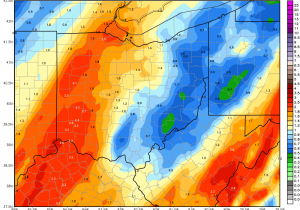 Apparently, salamander movement this time of year is triggered by rain combined with 50+ degree temperatures for a couple of consecutive nights. In this case we’d had both — especially the rain part. 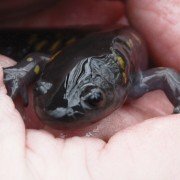 Ohio is home to 24 species of salamanders in five different families. 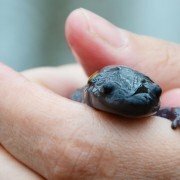 Salamanders are long-tailed amphibians that live on land, in water or both often on forest floors and in streams, ponds and pools in the woods. Salamanders eat invertebrates insects and worms and serve as food for larger animals. 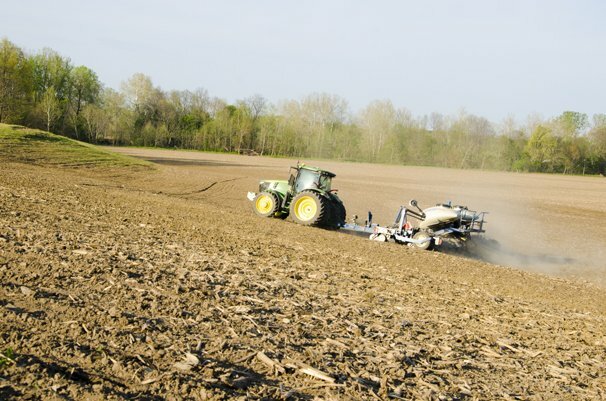 They often hold clues to the environmental conditions of the area. 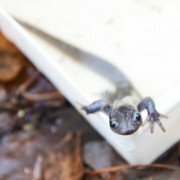 Salamanders do most of their moving at night and those with a flashlight and a willingness to slog through the woods in the dark can often find many of them as they flee from the light, but to get to see them more closely, trapping works well. 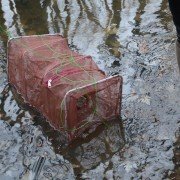 The traps are box-shaped nets with places for the salamanders to get in, but not back out. I could not believe what we found! 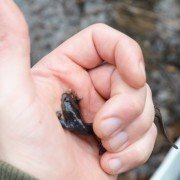 I have been crawling around in the woods and the swamps around the farm since I was a very young boy and I have never seen salamanders in the wild before. We found well over 20 Spotted Salamanders, a Jefferson Salamander and a Small-mouth Salamander. After we caught them and counted them, the salamanders were released back into the water. They return to the same pools year after year. Another note, the traps and boots of experienced salamander hunters are bleached after each trip to maintain the health of the separate populations of salamanders — salamander biosecurity. 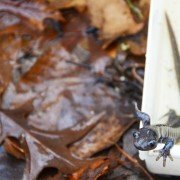 Here is a bit more about the salamanders we found from the Ohio Department of Natural Resources Division of Wildlife. Spotted Salamanders are found throughout Ohio in low-lying moist woodlands adjacent to swamps, ponds, and creeks. Because of their secretive nature and their love for tunneling underground, they are seldom seen except in early spring. Then they migrate in large numbers to breeding ponds. Even then, they are active only at night. Often the only evidence of their presence is a fist-sized egg mass containing less than 100 eggs attached to a submerged stick or plant. How does a six-inch salamander pass a fist-sized egg mass? The eggs are not that large when laid, but the jelly-like substance that covers them swells when the eggs come in contact with the water. This large, chunky salamander has two irregular rows of yellow or greenish-yellow spots. Occasionally, the spots on the back of the head are orange. This salamander looks somewhat like the Spotted salamander species without the yellow spots. They have long toes and the sprinkling of small silver-blue specks concentrated on the sides of the body on younger specimens. It lives in moist woodlands throughout most of the state. It is very secretive and seldom seen except in early spring when it enters shallow woodland breeding ponds. Named for its conspicuously small mouth, this animal also has a relatively small, narrow head. Its dark earth- tone color may be accented with light flecks of pigment, especially along its sides and bottom. The Small-mouthed Salamander is one of the least particular in its choice of habitat. 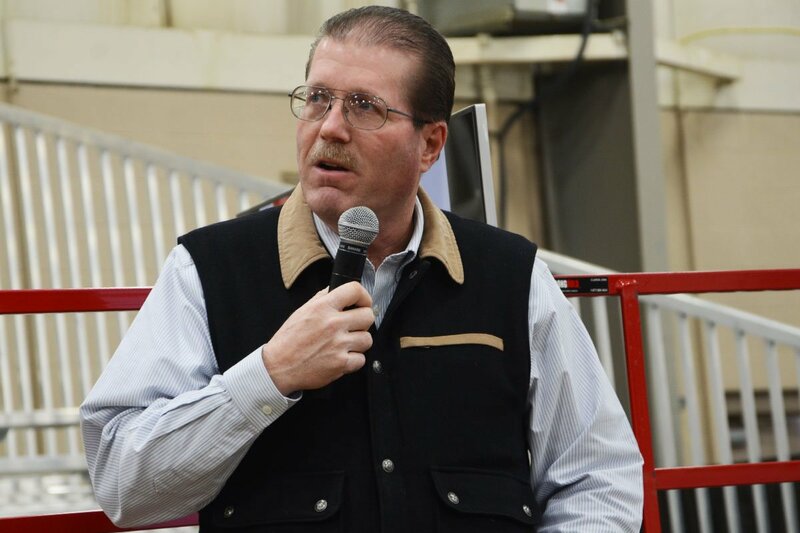 It can be found in just about any situation throughout all but the extreme eastern edge of the state, and like most members of this family it breeds in temporary ponds or wetlands. 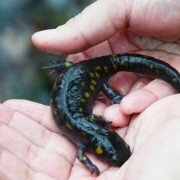 For those who want to learn more about these fascinating Ohio natives, Getting to Know Salamanders (22 pages, $7.50) gives details on Ohio’s common species, how to see them, where to see them and how to take care of the places they live. 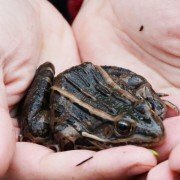 It’s published by Ohio State University Extension and can be bought through county offices or the online eStore, http://go.osu.edu/salamander. 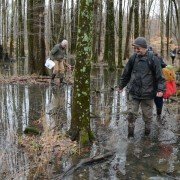 Even if the weather is less-than-ideal, I’d recommend a fascinating salamander hunt any day. I got to hold the Jefferson salamander. It is important to get your hands wet before handling them. We also caught a Leopard frog. 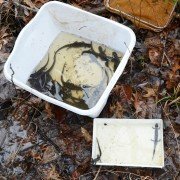 Spotted salamanders fill up the top container and the Jefferson and Small-mouth salamanders are on the bottom at Hague’s farm.